We have been propagating peonies to various parts of the RainyDayGarden the last several years. The new plantings have taken root and we have had some nice big blooms. As anyone who has grown peonies can attest, the flowers can be very “droopy,” especially after a rain storm. This was why we were excited when Gardener’s Supply Company announced new Essex supports especially suited for plants such as peonies! They come in fixed or adjustable style and in a variety of sizes. 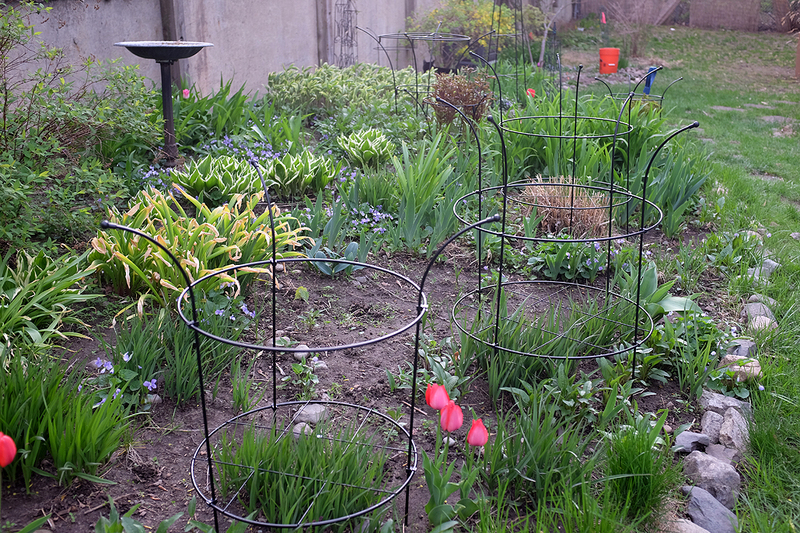 We got our eager hands on a few different ones to see how they would do in the RainyDayGarden. Gardener’s also has versions of the Essex supports which are adjustable. They look similar to the fixed-ring units, but instead of the rings being welded on, the they are attached to the posts by special clips. Also, with these supports both the upper and lower rings are the same diameter, enabling the rings to slide up/down on the posts independently. We have a general idea of how tall and wide most of our plantings will be when matured. 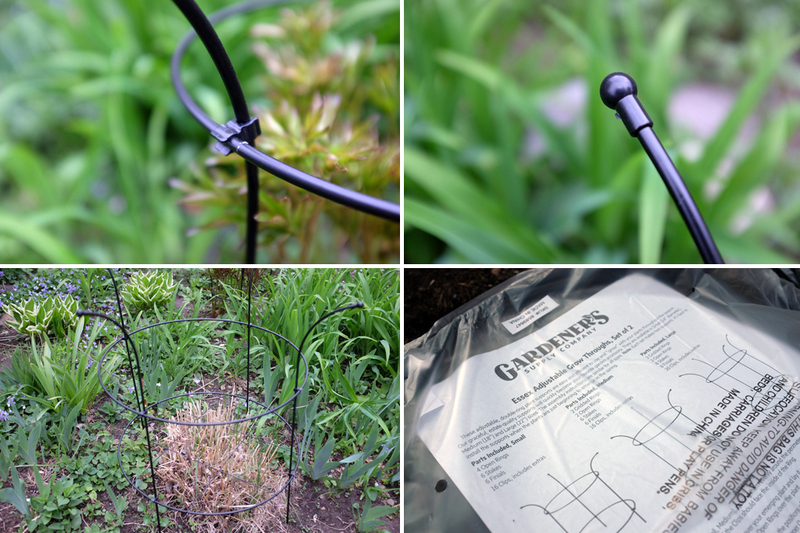 However, as these supports are new to us, we are pairing them with a variety of plants (Peonies, Spiderworts, Zebra grass, etc) to see what works best with what. 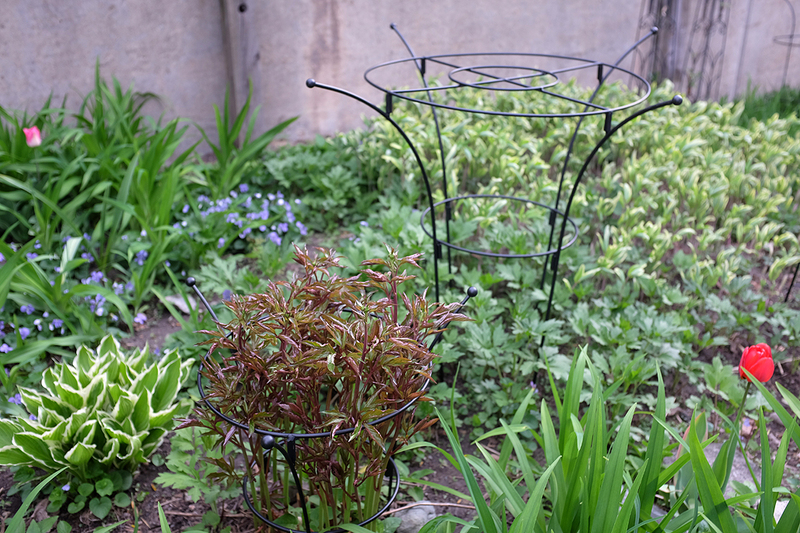 Small supports are 25 inches high with 14-inch diameter rings, perfect for first- and second-year perennials including peonies and salvia. Also great for poppies, some campanula, and globe flowers. Their installed height is approximately 20 inches. Medium supports are 29 inches high with 18-inch diameter rings, ideal for gaillardia, veronica, and some asters. Installed height is approximately 24 inches. 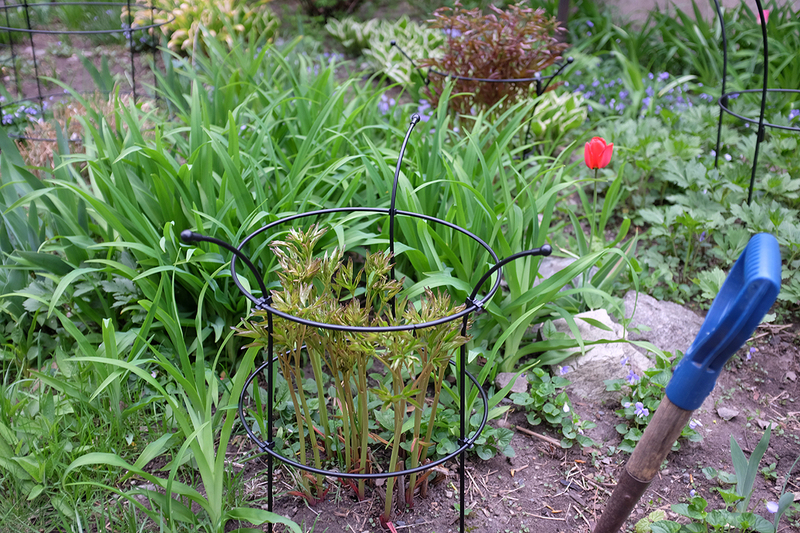 Large supports are 35 inches high with 22-inch diameter rings, perfect for peonies, baptisia, centaurea and other established, taller perennials. Installed height is approximately 30 inches. We are very excited to have these plant supports installed in the RainyDayGarden and are eager to see how the plants will look once they have grown into them. 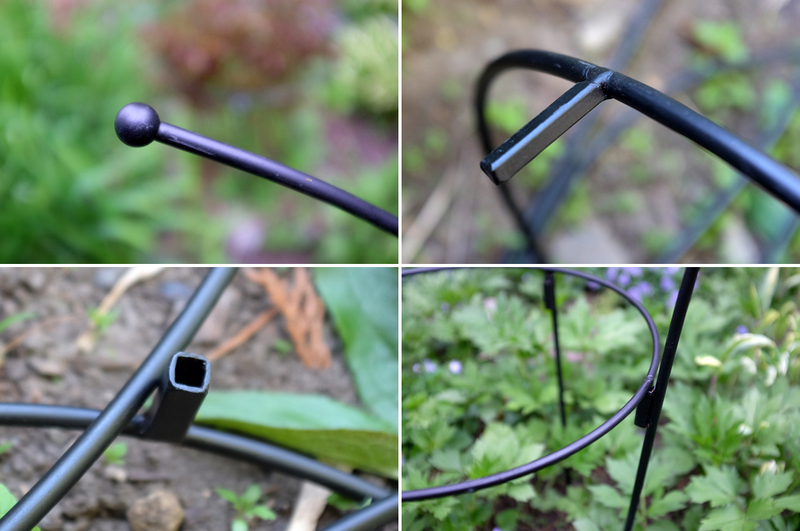 Those interested should check back monthly as we will be posting updates on the progress of the plants and our thoughts on these Essex plant supports from the Gardener’s Supply Company.